The Johnson Team at RE/MAX Real Estate Group hosts Foster Parent Date Nights for Hope & Home parents. We will happily watch the kids for about three hours. This helps keep the homes happy, the marriages of the foster parents strong and the number of children sent back into group homes low. Realtor Jeff Johnson, of RE/MAX Real Estate Group, is proud to announce, starting November 1, he and his team will be hosting Foster Parent Date Nights for Hope & Home parents. Foster parents can drop their kids off and The Johnson Team will watch them so they can have some time to themselves to regroup or just regenerate. Hope & Home is one of the largest, most dynamic child placement agencies in the state of Colorado, with hundreds of children rescued from the foster-care system and happily adopted. Each year it provides short- and long-term in-family care to hundreds of children in crisis. Foster parents who want to participate in Foster Parent Date Nights can message Jeff on Facebook or message The Johnson Team Facebook page. 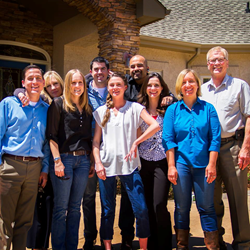 The Johnson Team has dedicated agents that specialize in working with both buyers and sellers. They’re committed to moving mountains, whether that mountain is helping you sell a home or helping a child into a home. For more information, please call (719) 930-5169, or visit http://www.jeffjohnsonworks.com. RE/MAX Real Estate Group is located at 215 W Rockrimmon, Colorado Springs, CO 80919.